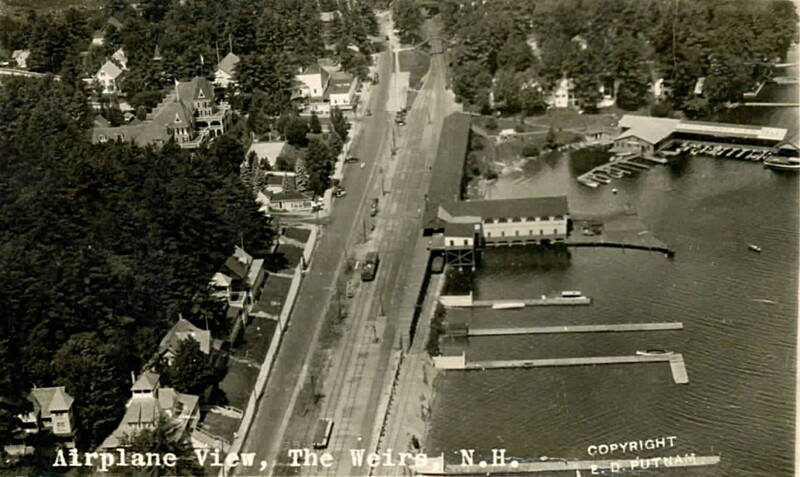 This is the oldest known aerial of Weirs Beach. It clearly shows the twin turrets of the New Hotel Weirs, as well as the original Winnipesaukee Pier. This dates the photograph as taken prior to the Great Weirs Beach Fire of November 9, 1924 which destroyed these two structures, as well as many others in Weirs Beach. Clearly seen in the upper center of the photo is the pedestrian footbridge which crossed the railroad tracks to the Lakeside House. (The four-story Lakeside House itself cannot be seen, as it is heavily obscured by the pine grove which surrounded the hotel prior to the 1938 hurricane.) On Lakeside Avenue, the multiple railroad tracks, as well as the utility poles down the center, clearly stand out. Also noticeable is the spur railroad track descending down to the railroad station and wharf, where cargo could be more easily loaded upon the Mount Washington steamer, which is not seen in this photo.